England coach Stuart Lancaster has dealt a blow to the Top 14-based players hoping to force their way into the international picture. The Toulon trio of Steffon and Delon Armitage and Andrew Sheridan are among those to have caught the eye this season in France's top flight but their chances of reigniting their respective Test careers appear remote after Lancaster reiterated his policy of not picking players based overseas. Lancaster insists "they are not out of the reckoning" entirely and will no doubt continue to monitor all the players based in the Top 14 but none are likely to feature when he names his squad for the end of year internationals next Thursday. "What makes it difficult when a player plays in France is they are not available for our camps when we need them," Lancaster told BBC Radio Five Live. "We have got a camp coming up at the end of this month (at St George's Park) and we have an agreement with the Premiership clubs to have access to the England players. "It is not under the IRB release window so we can't get the lads who are in the French clubs. Toulon were in the French final the day we played South Africa in the first Test (in June) so it creates problems from that point of view. You would never say never but it is always going to be harder for players playing in France." 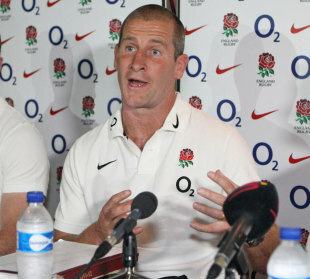 Lancaster retains the option to look overseas to fill any perceived void in what has been labelled 'exceptional circumstances' but there is a belief within the current coaching team that they have enough options at their disposal. Steffon Armitage was voted the outstanding player in the Top 14 last season and the openside has won rave reviews against this season but forwards coach Graham Rowntree was quick to point at the standards being set by Quins flanker Chris Robshaw. "Over the summer tour Chris Robshaw stole more ball than any other seven playing in the summer, including New Zealand and Australia, but he is also a credible lineout threat and a ball-carrier," Rowntree said. "Nick Easter is playing well," Rowntree said. "We are well aware of his form but since this coaching crew came together, post the World Cup, we decided to look a bit younger, the likes of Ben Morgan, Thomas Waldrom, Phil Dowson have been playing eight for us. "We are quite happy with their development because we have to look at the next World Cup. The door is not closed for Nick. He knows that. Age is not so much counting against him but the guys we have got there we are very happy with. If there is an injury, Nick knows he is one we will consider."